Chloraka Village Apartment – This top floor, two bedroom apartment is located in the popular village of Chloraka within easy walking distance to the beach, local shops, transportation & restaurants. The living accommodation includes a bright, open plan living room with lounge and dining area. Through a decorative archway is a galley style kitchen including built-in oven, ceramic hob, microwave, fridge/freezer and washing machine. Double glazed sliding patio doors in the lounge provide easy access to a covered balcony from where you can enjoy the stunning panoramic sea views and beautiful Paphos sunsets. Off the living room is a hallway leading to two good sized double bedrooms with fitted wardrobes plus a family size bathroom. The complex is charming in character with quaint stone featured walkways and is very well maintained with an organised management committee in place. The buildings have recently been painted and facilities include an impressive swimming pool, large surrounding sunbathing terrace with sea views, children’s paddling pool, changing rooms, toilets and both indoor/outdoor showers. The property is highly suitable as a holiday home and/or rental investment, comes fully furnished and has title deeds. 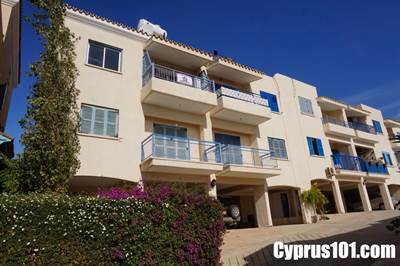 Next → Next post: Villa in Coral Bay – Suitable for Permanent Residence Scheme – Walk to the Beach!